I bring you a photo of my breakfast. I have my usual cup of green tea, rather several and along with it a simple fruit salad--the salad had mainly melons and apples but with a little twist. I added some lemon juice and sprinkled some MDF Chunky Chaat Masala and some rock salt. 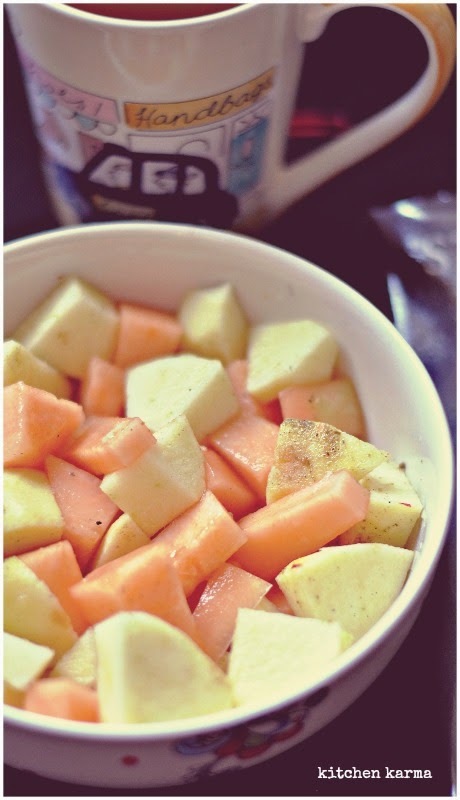 The salt and the spice turned a boring fruit salad into something yummy. This was inspired by the fruit chaats you find in the streets of Delhi. Excellent pics of the fruit salad.